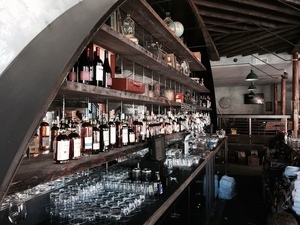 The bar at Harper & Rye. Photo courtesy of Nate Valentine. ￼Opening this Thursday in the former Red Devil Lounge is ~HARPER &AMP; RYE~ from Jamal Blake-Williams (The Tipsy Pig, Mamacita). Our previous post outlines the new design and layout, and now we have a copy of the cocktail menu from David Ruiz (Padrecito), which is a mix of highballs ($9), cocktails ($10), and punch jars ($38, serving four). There are also 12 beers on tap. Hours are Mon-Fri 4pm-2am and Sat-Sun 2pm-2am. 1695 Polk St. at Clay. Now softly open in the Lorin District in South Berkeley is ~HOI POLLOI BREWPUB~ from owner Viet Vu. They are brewing their own beer, in addition to pouring guest craft beers (and wines)—according to their Facebook page, there’s currently a “session-able IPA and amber on tap.” Music will also be a focus at this neighborhood joint (the full name after all is “Hoi Polloi Brewpub and Beat Lounge”). Hours are Tue 4pm-12am, Wed-Thu 12pm-12am, Fri-Sat 12pm-2am, and Sun 12pm-10pm. 1763 Alcatraz Ave. at Adeline, 510-473-7634. The bar at Otis. Photo via Otis’ Facebook page. According to some liquor license activity, it looks like ~OTIS~ on Maiden Lane has a new owner, and the current Otis website and phone number are both deactivated. We’ll have to see what new owner Joseph Garvey Scott has in store for the space. 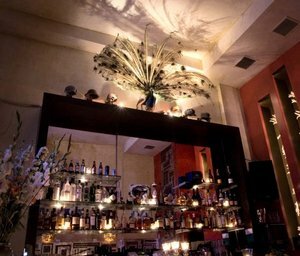 [Update: Eater reports Joseph Garvey Scott, “the founder of scavenger-hunt outfit CLASH,” will be opening ~ROMPER ROOM~ in late summer, “which will host CLASH’s boozy scavenger events for office groups by day, then transform into a bar with an 85-person capacity in the evening.”] 25 Maiden Ln. at Kearny. From Monday June 2nd through Sunday June 8th, you’ll be seeing a lot of Negronis (and twists on Negronis) being stirred during Negroni Week. Participating bars and restaurants (all over the country!) will be donating a portion of every Negroni sale to a charity of their choice. There’s a passport so you find participating bars on the list, swing by for a Negroni special, and get your passport stamped. Around town, keep your eyes peeled for The Northern California Negroni Council, the (nc)2, which is comprised of some of our top local bartenders. (I am loving their manifesto.) They’ll be cruising around town in their red Members Only/(nc)2 jackets and supporting participants in the program (i.e., they’ll be drinking), so be sure to tell ‘em they look snazzy. There will also be Negroni edibles, like a Negroni Pop (popsicle) available at Humphry Slocombe, and Tango & Stache will be serving Negroni pork belly tacos at Holy Water on Wednesday June 4th and at Rye on Thursday June 5th. We’ll have even more details next week on who’s pouring and serving what. See you! 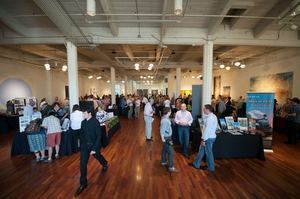 The Taste of Mendocino event in 2012. Photo © Marc Fiorito, Gamma Nine Photography via Facebook. If you don’t have time to make it up to Mendocino to taste wine, beer, and more from the county, you can attend Taste of Mendocino on Tuesday June 10th here in the city. A variety of wineries will be present (including Coro Mendocino, Husch Vineyards, and Navarro Vineyards), plus some artisan product purveyors, destination outfitters, brewmasters, chefs, and innkeepers (read the list here). The event is at San Francisco’s Golden Gate Club in the Presidio, 2pm-7pm. Tickets are $50. Golden Gate Club, 135 Fisher Loop.